Sterling Hill was a zinc mine, and the last operating underground mine in the State of New Jersey. It closed in 1986 after more than 138 years of almost continuous production, during which it yielded more than 11 million tons of zinc ore. The ore was fabulously rich, averaging more than 20% zinc, and occurred in thick seams that were worked to a depth of 2,550 ft below the surface, through workings totaling more than 35 miles in length. With such a lengthy history it should be obvious that zinc has long been in demand as a raw material useful to society. That remains true today. Below are just a few of the ways we use zinc in our daily lives. Since 1982 pennies have been made not of almost solid copper as before, but of 98% zinc with a thin coating of copper. The reason is economic; zinc is by far the cheaper metal. The thin coating of copper is necessary so we don't confuse pennies with dimes; they're about the same size. Zinc was also used to make pennies during the Second World War when copper was needed for the war effort. Those pennies were made of steel, with a zinc coating as a rust preventative. Several parts of most cars, including carburetors, door handles, and fuel pumps, are die-cast parts made of zinc. Zinc is ideal for this purpose because it doesn't shrink upon solidification from the liquid state, so a true-dimension casting can be made. About 20% zinc oxide is added to automobile tires to strengthen them and help in heat dissipation. Zinc is used in diaper-rash medicine, zit medicine, anti-itch creams and lotions (e.g., calamine lotion), and dandruff shampoo. Zinc is a necessary trace element in the human body. Your immune system cannot operate properly without it, and you would quickly die of disease. 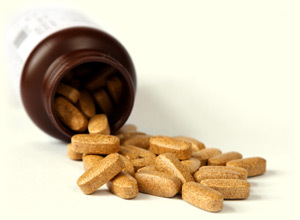 Most vitamin pills contain zinc as a mineral supplement. One brand of pill (Centrum) states that it contains everything "from A to Zinc". Zinc is also found in many foods like red meat and dairy products. Iron or steel is commonly coated (galvanized) with zinc to prevent it from rusting. Trash cans, nails intended for outdoor use, guard rails along highways, chain-link fences, metal roofs, and gutters and downspouts are commonly made of galvanized steel. Zinc oxide, a pure white powder, is the opacifier in much paint. Without it the coverage would be poor because previous coats of paint would show through the new one. The zinc oxide renders the paint almost completely opaque, even in thin films. Zinc oxide is opaque not only to visible light but to ultraviolet light as well, and so makes an excellent sunblock. If you see someone on the beach with a white nose, that's zinc oxide. Brass, an alloy of copper and zinc, is stronger than both metals alone. Brass is commonly used where strength is a factor, as in the casings for bullets, brass handrails in theaters and restaurants, brass valves in bathroom faucets, gears in clocks and watches, etc. The attractive gold color of brass also lends it to many decorative uses in the home, such as lamps, door handles and locks, curtain rods, and lighting fixtures. Any of you who play trumpet, trombone, or any other brass instrument in your school band or orchestra are using zinc as well. As you can see -- we use Zinc every single day!